A versatile, practical and simple to use low resistance measurement instrument, offering computer/palm top recording of data to cover a wide range of applications. 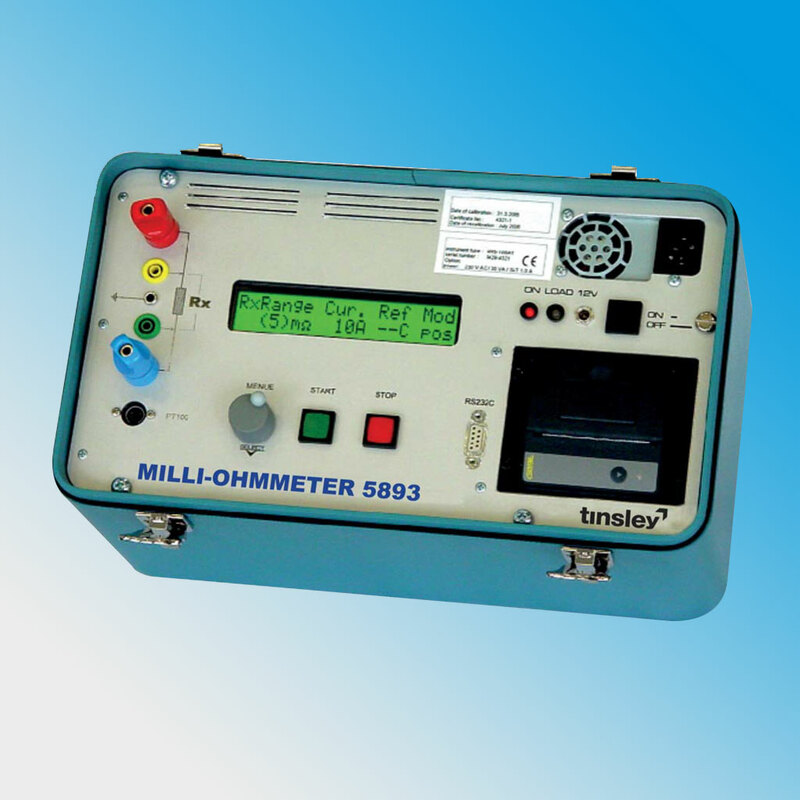 An advanced microprocessor based and battery powered micro-ohmmeter in a sealed ABS case. The 5893 provides 0.1 µOhm resolution resistance measurements in 6 selectable ranges from 600 µOhm to 60 Ohm. Designed with a wide range of useful features the 5893 will meet the requirements of many International Testing Standards. Ideal for laboratory and test area use as well as "on site - field tests". The microprocessor technology provides many advanced features which include internal digital calibration, a 6,000 count scale length and 6 resistance ranges displayed on bright easy to read LEDs. Lead resistance errors are eliminated by the use of a true 4-terminal, 4-wire Kelvin/Thompson circuit. Forward and reverse current with averaging is employed to remove any thermal EMF errors. Automatic measurements and data recording can be performed via the RS232 port to a PC or printer. A "Remote operation" socket for foot or hand switching with a "Print last reading" control, facilitates use in inaccessible and confined working positions. Portability of the 5893 can be enhanced with an optional battery powered computer and printer that can be housed in the lid of the instrument and is ideal for on-site calibration reports and certificates. Two internal re-chargeable batteries provide the test current and the supply for the measurement circuitry. The charging circuit has independent charge indicators for each battery with fast charging to 90% of capacity and automatic switching to trickle charge, for prolonged charging. Battery power is sufficient to provide up to 1 hour of operation on the two 10A ranges and up to 20 hours on all other ranges.